If some rooms are warmer or colder than others, this is usually just a matter of balancing. Meaning adjusting the airflow to each room so they all even out. Or sometimes making the rooms you choose more comfortable, and unused rooms less so. If a room is heating or cooling much quicker than other rooms, the airflow can be reduced to that room to even things out, also sending more air to other areas. If some rooms can't keep up with others and the airflow isn't as noticeable, make sure the air vents are fully opened. What is the best way to balance your ducts? 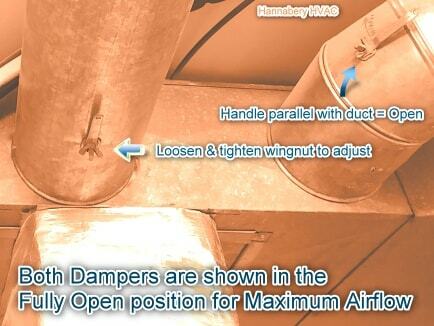 Many systems have dampers installed on the individual supply runs coming off the main supply trunk. This is either in the basement or attic. They are identified by little metal handles which open, close and adjust a metal damper controlling the amount of air through the duct. By dampening the air-flow here to rooms with too much air, it will send more air to the rooms that need it. If your system doesn't have dampers or if they are inaccessible, then dampening and balancing will have to be done at the supply registers themselves. Just adjust as necessary. In many homes, and mostly in two-story homes, there is usually one or two rooms that just can't keep up with the others. Maybe it has the longest duct run or the most elbows and turns. Maybe it is over a garage, exposed to more extreme temperatures. In most of these cases, balancing may help. But in extreme situations, such as poorly insulated rooms, or undersized ductwork, then no amount of balancing will fix the problem. 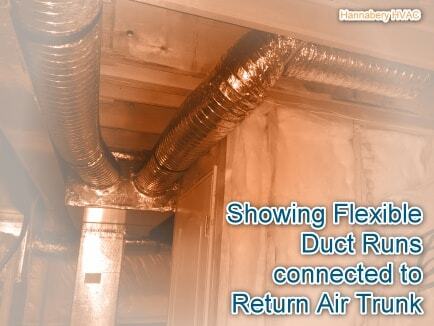 Having your air duct system professionally balanced might solve your problems, thus improving comfort and efficiency. Below is a list of possible causes. Items in red usually require a service call. Items in blue however can be addressed, some even fixed by the homeowner.